Description: First train of the day: I see the tail end of a short train crossing over aways back, so I decide to hit my favourite location. On the way there I see the nose of a GP9 coming down an otherwise unused spur, an interesting stroke of luck. Description: CN Zebra-Striped GP9 4119, trailing the 7080 on their way to lift some cars from Georgia Pacific on the Dixie Cup spur. Description: Hearing a sound getting closer, I point my camera expecting to see some red and black locomotive, when a freight car comes rolling by! 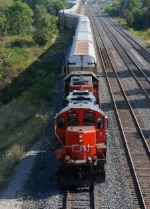 It's CN 7080 and 4119 backing back east towards Toronto. Description: Taken in Brantford, Ont. Description: Running around their train at the south end of the run-around, 7001 and 7080 switch the industries on the Torbram Industrial Lead at Walker Dr. Description: Originally built as a GP9 by GMD in 1957 and numbered CN #4121. Serial number A1283, 1750 h.p., class GR-17p, engine 16-567C. In 1984 it was renumbered CN #4377. In 1993 it was rebuilt as a GP9RM, chop-nosed by GMD/CN and renumbered CN #7080. Class GS-418d, engine 16-645C with 1800 h.p. Description: CN #7080 and CN #4710 pull a line-up of auto carriers through a very tight switch at the west end of the Aldershot Yard in Burlington, ON. Description: Like most railfans, I love rail yards - big or small. On an overcast Christmas Day 2014 at CN Port Robinson, not a creature is stirring...not even a Geep! Description: An empty oil train passes by yard power and a Rail Grinder and CN 2110 in London Yard.